Semi-desert. Open shrub and grasslands and woodland openings. Spring. 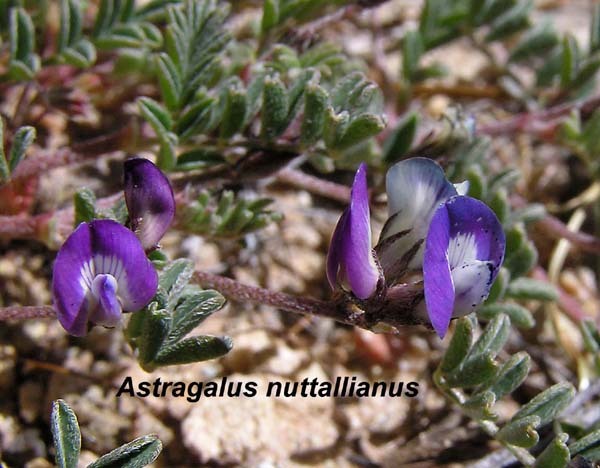 This is a very common annual Astragalus in the lower areas of the Four Corners region, often carpeting the ground. It is highly variable in form, ranging from the tiny, prostrate plant pictured to plants a foot tall covered with flowers. Leaflets range from 7 to 15 and flowers from 1 to 7 per cluster. A close look reveals a beautifully multi-colored flower with a tall, spreading banner.